Have you ever seen a caged bird set free? How about three caged birds set free by a child? It was one of the most powerful life moments I’ve experienced. Watching a little girl in my neighborhood set caged birds free. Setting birds free is a custom in Myanmar. I’ve been told different reasons why, but most motives point to merit. People believe the more good they do, the better their lives, and/or afterlife will be. 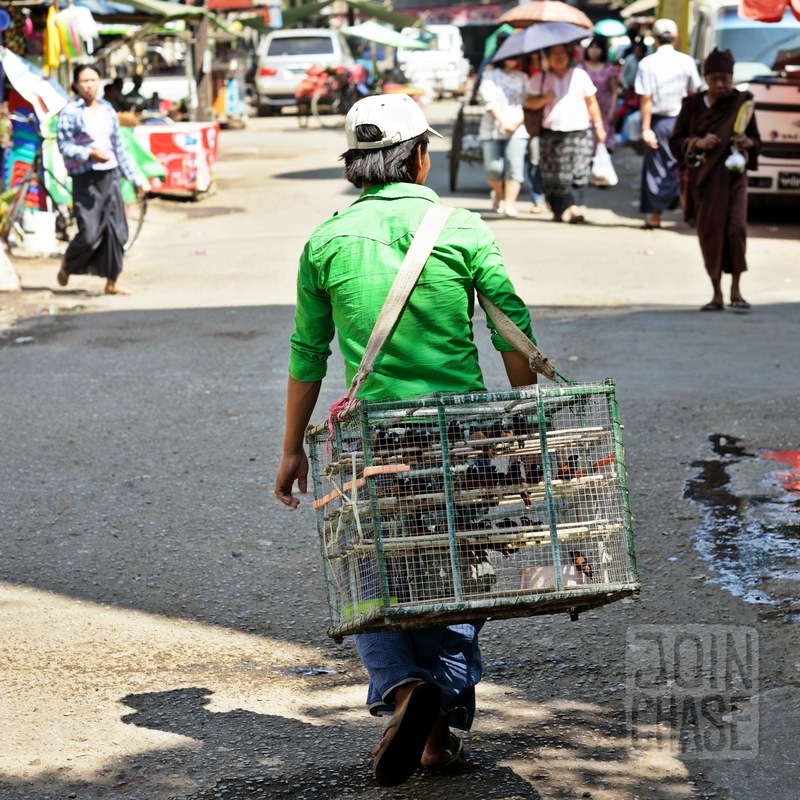 A man selling caged birds to set free in Yangon, Myanmar. March, 2014. 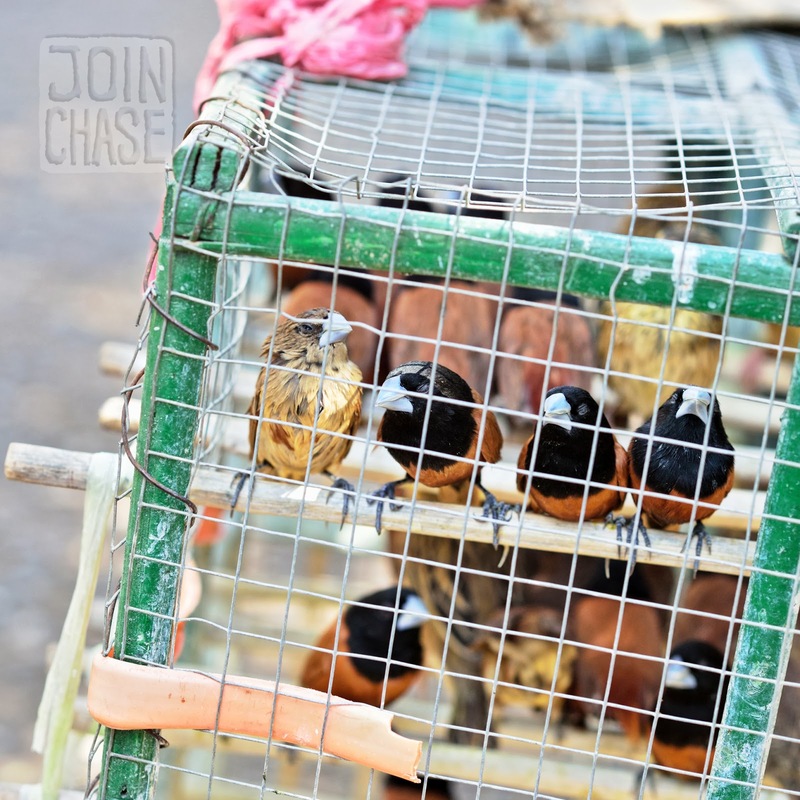 You can purchase a bird to free from a street seller walking around with tiny cages full of birds. It seems a bit silly to me. A person captures free birds, cages them, and then sells them to be freed. But, who am I to judge another culture’s norm? Observing children across the road from my apartment has become one of my favorite things about living on my street. There are three of them, two little girls and a toddler-boy. Watching them play and interact is so much fun. It makes me miss my nephews. I’ve seen them dance around, roll on the floor, have tea parties, and fight. As little kids do. And of course they’re always dressed in cute outfits with thanaka on their faces. Never before have I wanted a child so badly. Perhaps my “no children” stance has been lifted. On this particular morning, the family of one of the little girls was getting ready to attend a wedding. They had her dressed in a beautiful white gown. As she was hopping about the paved area in front of their apartment, a man with cages of birds approached her. What I saw next brought me to tears. He knelt down, reached in one of his cages, grabbed a bird, and handed it to the girl. She took the little bird in her hands, held it for a moment, and then threw it into the air. That’s when I realized what was happening, before I knew anything about this tradition in Myanmar. She was setting caged birds free. The man took out another bird and gave it to her. I watched her facial expressions this time. The joy on her face was obvious. Mixed with a little terror, excitement and surprise as she let it go. When he handed her a third bird, she jumped as she set it free. As if she were about to fly as well. It was one of the most powerful life moments I’ve experienced. Watching a little girl in my neighborhood set caged birds free. Something about freeing birds really gets to me. Cages or wings? Which do you prefer? Ask the birds... This line from one of my favorite songs in the musical, Tick, Tick, Boom, has been a big part of most of my adult life. Sometimes I put myself in cages. Other times I’m caged by circumstance, by language and cultural barriers. Myanmar has been extremely caging for various reasons. I want to be free. Free as a bird. Free as a child. The only interaction I’ve had with these families has been waving, gesturing, smiling, some gift giving, and lots of stalking each other from our windows and balconies. I want to change that. I want to get out of this cage I’m in, and make more of an effort to get to know my neighbors regardless of the differences between us.